Why this book? Because I'm a self-sufficiency wannabe. That means I look for ways to make cheese without having to continually buy cheese cultures. My first cheeses were based on a recipe that I called my Little House on the Prairie Cheese. I used whey as my starter culture instead of a meso or thermophilic culture. Those first cheeses were okay, but I wasn't entirely satisfied with them. This book uses kefir, which I make regularly, so it perked my interest. To start, I wanted a firm, ready-to-eat cheese that I could slice for sandwiches or burgers, or grate to use in eggs or fajitas. For that it made sense to start with the basic rennet curd cheese (chapter 13), because the author says it's the foundational cheese for most other cheeses: fresh, brine-aged (feta), pasta filata (stretched cheeses such as mozzarella), white-rinded, blue, alpine, washed rind, washed curd, or cheddared. That's a lot of variations from one basic process, so it seemed like the place to start. For 1/32 teaspoon rennet I used my smidgen spoon. The instructions said the curds would knit together as they sat in the molds. I was a tad dubious how well that would happen without weighting them, but at that point I had an errand to run, so off I went. A couple hours later I was able to remove them from the molds. Okay, not bad. Not smooth, but firm. They were firm enough to handle - no crumbling. I was impressed. I rubbed each with canning salt. They were covered with a dish cloth and allowed to air dry for about 24 hours, flipping occasionally. I was very curious when I sliced the first one and was pleased with the texture. They were firmer than I expected, especially for the curds only being hand packed. And the cheese had good flavor, even without aging! A keeper! The other thing that is different with this recipe, is that the curds weren't "cooked." That's usually what's done after the curd is cut in the pot. The temperature of the curds in whey is typically raised to anywhere between 100°F (38°C) and 110°F (43°C) depending on the desired result. This recipe maintained a curd temperature at 90°F (32°C). The final test was the melting test. Grilled cheese and tomato sandwich. Yum! It melted beautifully and made a delicious sandwich, especially with a slice of homegrown tomato! Definitely a keeper. The only thing I will do differently next time is to put all the curds into one mold. I'd like the cheese to be sandwich size and fit on a slice of bread. I'm really excited about this new direction for my cheesemaking. I have quite a bit of milk right now, so it's a good time to experiment. *NOTE: Practically all of my homemade cheeses are made from skimmed milk. Not because I especially want it that way, but because I use my own raw goat milk which is not homogenized. Goat cream is slower to rise than cows cream, but by the time I'm ready to make cheese, it is ready to skim. ** This has been one of my cheese making challenges, because whole milk cheeses are tastier than skim milk cheeses. David's book explains that once the cream has separated from the milk it can't be reincorporated to make a whole milk cheese. The cream comes out with the whey! I've had that happen and now understand why my old time cheese recipes, such as in Martha Washington's Booke of Cookery, often call for adding that morning's milk to the previous day's milking. Their cheeses would have been partially whole milk cheeses. Thanks Yarrow! This book is wonderful for anyone working with raw milk and who also wants to work with natural cheese cultures. I love how he explains everything, so that I understand why something needs to be done. I feel like I'm getting a better grasp on it that how I've done it before. Currently experimenting with his feta recipe. Two batches - quite different results! But I think I know why, which will hopefully make for a good post on that too. I'm really missing cheddar, so that's my ultimate goal! Very interesting, & impressive too. Mrs. Shoes, I find it fascinating and was really happy with the results. This particular recipe is the base recipes for most of the others in his book, so it's the foundational process to learn. Nice that it's tasty too! Thank you so much for sharing this. When I made cream cheese and others, I too got a bit tired of having to buy a culture to make it. I'm saving this info, for when we have dairy goats again here. That cheese looks amazing! Kristina, thumbs up for that! Kefir or other natural cultures are the way to go. I got into kefir because unlike yogurt, it continues to grow and sustain itself. With yogurt, I was always having to buy new because eventually it poops out. The kefir has a broader spectrum of probiotic organisms too, so it's a really good choice for all of the above reasons. M.K., it was one of those light bulb moments! The kind that can only be figured out by experiencing something. It will make a difference in all my cheeses to come, but I also had to add a second note about Kinder milk. I'd given up on skimmed goat milk as coffee creamer until Dan got some flavored coffee that really needed it. I got out the skimmed Kinder milk and was amazed at how much creamer it was than my other breeds. Even though I don't have a milk source (or even time) to make my own cheeses, I do enjoy reading about your testing process to come up with your new recipes. Leigh's Test Kitchen of Cheeses! Awesome, Leigh! I can't wait to try this myself. Hopefully next year - we'll see! Would love to share your tasting experiments. This Farm Girl isn't going to be milking goats or cows any time soon, though. I never did get the hang of milking, thank goodness, although Mama tried to teach me. It's a blessing you can make your own cheese. My wife and I eat a lot of it, and we spend a lot of money on it. You not only know that your cheese was well made and there's nothing nasty in it, you don't have to spend a fortune to have it. Okay it's settled...I'm making grilled cheese for dinner! :) Congrats on the cheese, it looks really great. 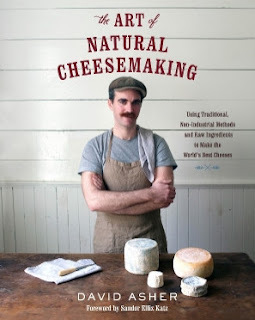 That is the book I have too, but I've never made any of this cheeses. I guess I go the culture/additive route for now, but eventually I'm hoping to try a new way of doing things. Cheese is a big thing in my house, everyone loves it. I need to get into making cheese from scratch. Thank you for this information, I make sure to make a mental note for the future. Caroline, does that mean you're close to getting your Kinders? That would be great! Harry, I so agree. Being able to grow as much of our own food as possible is rewarding and satisfying. I really like have whole foods with simple ingredients! Oh, are those stainless steel cheese moldes??! Here in germany it seems one can only get plastic ones... where did you find them? I have been looking for alternatives for some time now. Katha, yes, they are stainless steel. One is from a wine press I bought many years ago when I first started making herbal tinctures. It was a local purchase at the time. The other is a cheese press that I bought off eBay. The stainless steel molds are a little more expensive than the plastic molds, but I think they are worth it!